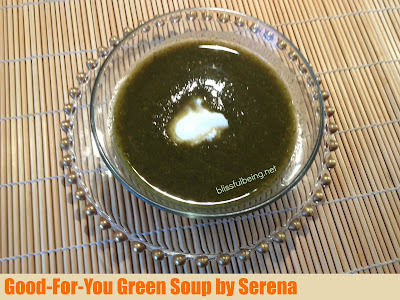 Many times in class, I've mentioned the green soup that I make each morning and enjoy before I start my day. I'm finally sharing my recipe here with my students and anyone else who may come across this post. It's loaded with vitamins, minerals, and fiber -- all of those great things that we are all trying to integrate more of into our daily lives. Quick way to easily get your 2-3 daily servings of vegetables. Pure unprocessed source of vital energy in the morning. The plan: Make a large pot. Keep what you need for the week, and freeze the rest. Your choice of a variety of leafy green vegetables such as kale, chard, spinach, mustard greens, cabbage, collard greens, and bok choy, and a handful of parsley, along with carrots, onions, and celery. Also have a lemon peel nearby to zest for flavor and as a preservative. Slice or break up into pieces, just enough to make it easy on your blender, each of your selected veggies. Place the vegetables into the pot with the water and bouillon base to taste (I use about 3-4 tablespoons). Turn the heat up to high, bringing it just to a boil, then turn down the heat to a slow simmer. Cook covered with lid slightly askew to allow steam to escape, until vegetables are soft, about two hours. Let it cool to handle. Start ladling into your blender* (or use an immersion blender). Purée. This is now your base soup, which can be enhanced by adding variety with nuts, yogurt (I added a dollop of Greek yogurt in the photo shown above), Indian sprinkles, curry, Italian herbs and seasonings, sautéed garlic, or whatever you heart desires. Enjoy. Freeze any portion that you won't use over the next few days. * if you leave it a little bit chunky, you'll have more of a sauce that you can ladle on top of poached chicken or noodles, for example. Thanks for stopping by. Let me know how this recipe goes for you, and please feel free to share it. Here's to your health! Stop in again soon for more interesting topics supporting your pursuit of well-being.